Are you on the fence about picking up a 3D TV? Would some free PS3 games win you over? People who purchase Sony's first 3D capable TV, the Bravia HX800 will be given a code to download free stereoscopic games for their PS3s. 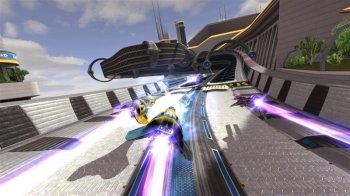 Purchasers will be able to download full 3D versions of Super Stardust HD and WipeOut HD, three episoides of Pain and a demo of MotorStorm: Pacific Rift. The offer is only good in Europe unfortunately, although it's possible that Sony may roll out some similar deal for other territories. Sony has said that it has many studios working on 3D titles and is "very optimistic" about the technology. No pricing details have been announced for the new TVs yet, but Sony is saying that it will be affordable. The HX800 is set for release this June, with the PS3 getting a firmware upgrade around the same time.